Note: this cable ONLY converters from HDMI to VGA, NOT VGA to HDMI. 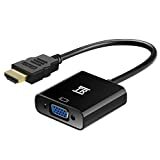 Connects an HDMI compatible device to a monitor or projector with VGA port easily; a VGA cable is required. Built-in active IC chip improves compatibility. Included Micro-USB Charging cable and audio cable provides additional power for devices with low-power output HDMI port such as MacBook Pro, Apple TV, Rasberry Pi, Smart Android TV Box. Supports resolutions up to 1920x1080 (1080p Full HD) including 720p and 1600x1200 for HD monitors or projectors. Gold-plated HDMI connectors, improve the signal performance and protects HDMI port of your device; wear and corrosion resistance to ensure a long lifespan. Compatible with Apple TV, PC, Laptop, Ultrabook, Rasberry Pi, Chromebook, Macbook, Roku streaming media player, Smart TV Box and other devices with HDMI interface. Plug the included 3.5mm audio cable into the audio port of the HDMI to VGA adapter and the port of your audio output device. This gold plated HDMI to VGA adapter offers a convenient and reliable solution for connecting an HDMI source device to a monitor or projector with VGA port. It features a built-in active IC chip that improves compatibility and delivers sharp picture quality. 1. This is NOT a bio-directional converter. It only transfers signal from HDMI to VGA. 2. To work with low-power HDMI devices, please plug the included USB to Micro USB cable into the USB port of your computer/wall charger and the DC port of the HDMI to VGA adapter. Lifetime warranty, 100% RISK FREE and Money Back Guarantee.